This new 78th Issue of Practical Welding Letter opens with an Article on Welding Education vs. Training written specially for this publication by Professor Yoni Adonyi, Ph.D., P. E., Omer Blodgett Chair of Welding and Materials Joining Engineering at LeTourneau University, Longview, Tex. The opportunity of learning from this and, hopefully, from further valuable contributions he kindly agreed to send us, is highly appreciated and should be welcomed by our audience in that it makes this publication even more interesting and useful. Follows a short note with a few tips written to help a student trying to make an acceptable braze-welding on a specimen for passing a test and starting the next training level. For the section on Consumables a primer is given on precautions needed to prevent the introduction of Hydrogen with the Consumables, when welding steels susceptible to Hydrogen Embrittlement. Computational Weld Mechanics is an active developing technology aimed at providing forecasts as to the behavior of complex structures upon welding, by examining the virtual numerical results of finite elements exercises on parallel proposals of different physical techniques, with the purpose of selecting the most appropriate before making costly tests. A few notes on recent successes are reported. The interview published here is with Paul Ipolito, a long time friend and collaborator who kindly submitted a summary of his personal experience and a few suggestions to new welders planning their own careers. In the Website Update section two new pages are introduced, the first dealing with practical aspects of Managing Welding Operations, the second with a mature welding process, that using Electroslag for Welding, useful and highly cost effective in a few niches of application. Other sections appear at usual at their place. Readers are invited to let us have their comments and feedback, as well as contributions of personal experience or suggestion of new subjects that might interest our audience. Use the Contact Us form to let us have your comments and feedback. (Don't use Replay). This opinion piece attempts to clarify differences between education and training, as well as accreditation vs. certification, as applied to the welding/materials joining field. Instead of being elitist, the author contends that proper understanding of the above concepts could improve the quality of service provided by the welding professionals to society and could contribute to future prevention of catastrophic failures in engineered structures. This paper is aimed at Engineering Managers and other Supervisors who employ Welding Engineers, a position that can be filled by either Educated as well as Trained professionals. The hope is that managers will recognize the strengths and limitations of each category of individuals and make better use of their talents. To better understand EDUCATION, it is appropriate to look at the word's etymology, as it originated from the Latin "educare" which means to rear, to lead forth, to draw out something potential or latent. Synonyms defined by Merriam Webster Dictionary include: to persuade or condition to feel, believe or act in a desired way. It may or may not include training by formal instruction and supervised practice to develop mentally, morally and aesthetically (Webster's Dictionary). On the other hand, the root word for TRAINING is the Latin word "traginare", which means to undergo instruction, discipline or drill (Webster's Dictionary). Synonyms include: the act, process or method to impart knowledge or experience acquired or to teach as to make fit, qualified or proficient. The clear implication is that training is more specific than education that begins at home and is a lifelong pursuit to find one's calling. Clearly, training may or may not be part of education (formal or otherwise). To use a culinary comparison, training is similar to using recipes from a cookbook, while education prepares one for writing a cookbook for new ingredients. Figure 1. Welder/operator training involves observation, practice, testing and results in an acquired skill for a trade. Good eye-hand coordination and steady movements are required in a hazardous environment. The associated concept of ACCREDITATION can be traced back to the Latin root word "accredere", which means to give credence to, and comes from the combination of the words 'ad' and 'credere' (to believe, a set of fundamental beliefs). In other words, accreditation means to give official authorization, to provide with credentials. For educational institutions, this means to maintain standards that qualify graduates for admission to higher institutions of professional practice (Webster's). Finally, the word CERTIFICATION comes from the Latin "certus", or certain, and means to attest authoritatively or to attest as being true or as meeting a standard. Another interpretation is to testify to the truth or genuineness of something – applies to a written statement, carrying signature and seal. The implications of the above differences are significant and need to be discussed candidly to avoid inadequate transfer of knowledge and applications that can result in costly repairs and sometime, catastrophic failures. The purpose of this paper is to clarify the differences between education and training, as applied to the welding/materials joining industry and the role of professional organizations in correctly promoting welding to future generations. If we put together the above four concepts discussed in the Background section, Accreditation is concerned with an Educational belief system, while Certification simply attests conformance with specific Training outcomes. One example from the US welding industry is ABET accreditation of a BSc degree in Materials Joining Engineering at LeTourneau University (since 1953) versus Certification of American Welding Engineers from the American Welding Society. Another famous program is the Welding Engineering Education at The Ohio State University (since 1946). The newest Engineering program is about to be launched in 2010 at Liberty University, all well structured accreditable programs. As the Background Section showed, Education is more inclusive (or can include Training), while the opposite is not true. However, the word Education is often misused to describe Training, simply because it sounds and sells better. One such example is the "Education" committee of the AWS that does not include any educators beyond 2-yr Associate Degree College level and certainly deals with selling Training activities that are Certified (see Certified Welding Inspector CWI Program). While these are commendable programs, they are clearly not Educational in nature and thus they tend to abuse the word Education. Similarly, several large welding companies "declared" that they offer training under "ESAB University" and other unofficial names that imply that they offer Higher Education level courses. This can be deceiving and unhealthy for the welding industry at large, as trainees typically think they know more about welding fundamentals than they really do. What is especially dangerous is that Training programs do not have to be periodically re-certified as academic programs have to be re-accredited every 4-6 years. Once a Training program is put in place, it can be run indefinitely, in spite of advances in science and technology. On the Education side, however, the Accreditation Board for Engineering and Technology (ABET), makes sure that each program has a system in place to provide ongoing quality education. The new ABET 2000 criteria are similar to ISO 9000 Quality Improvement Programs, where the main objectives and goals are defined and Engineering graduate outcomes are constantly measured by surveying stakeholders such as students, alumni and employers. After ABET approves this continuous improvement cycle that also includes sub-sections on curriculum, faculty, labs and other facilities, as well as institutional support, they return on a 4-6 years cycle to verify compliance and assess progress. Figure 2. 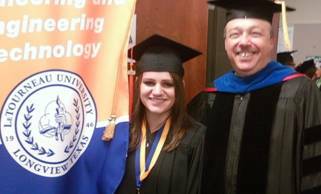 Welding Engineers (such as Mrs. Anna Biggs, Class of 2009, shown with the author at graduation) have to know design, metallurgy, processes and nondestructive testing. They have to analyze data, validate hypotheses, optimize costs while ensuring safety, communicate effectively and work well in teams. In conclusion, this opinion piece clarifies some of the differences between Education and Training, as well as Accreditation vs. Certification, especially when misapplied by some in the US Welding industry. Potential dangers of missing the above concepts were emphasized and proper dissemination of this information could eventually avoid catastrophic failures. Disclaimer: This is a collection of personal views and opinions on the subject by the author, based on his individual experiences in 33 years in the business practiced in three countries (Romania, Israel and the USA) and several industries (pressure vessel, aerospace, primary metals, heavy manufacturing, as well as academia). The author teaches at LeTourneau University, Longview, TX. I am indebted to the kindness of Professor Adonyi, who generously agreed to share with our audience from his experience and views. I hope we will see more of his instructive contributions in future issues of this publication. The Consumables used for welding Steels suspected of being prone to Hydrogen Embrittlement, are one of the possible sources of this gas, dangerous to the soundness of this work. Manufacturers exert their utmost diligence in providing low hydrogen consumables with the lowest and controlled level of moisture, at least for those intended for use on steels where there may be danger of hydrogen embrittlement. Storing conditions are then most important in preserving the low moisture. Therefore storerooms should be dry and warmed up at all times. Strict discipline in moving and handling consumables should be clearly stated in internal documents and enforced by suitable supervision. Therefore, together with other precautions, consumables must be scrutinized for making sure that they are not victim of careless handling. Rust (hydrated oxide) on welding filler wires. Moisture may be present in different forms, either as absorbed water vapor, or more or less tightly combined with the substances included in the shielding atmosphere generating materials. The treatments designed to remove moisture must be done at a sufficiently high temperature to drive out the most strongly bound combined water of crystallization. Dirt or lubricants and other materials used in drawing compounds used during manufacturing, from which hydrogen could be generated, must be removed by suitable cleaning methods. Under heat from the welding arc the sources may break down to liberate hydrogen ready to be picked up in the weld. A small contribution can be supplied by the humidity of ambient air surrounding the welding process, in spite of the shielding. The amount of hydrogen that can be extracted in the laboratory from a quantity of affected consumables is called the potential hydrogen level of that batch of material. This designation indicates that not all the available hydrogen finds its way into the weld. However to characterize the level of hydrogen introduced by a given consumable using a specific welding process, laboratory measurements are conducted on a given welded specimen, according to standard procedures. These determinations help in classifying the consumables, as provided by suppliers or as dryed up as specified by manufacturers, according to accepted convention. The weld hydrogen is considered very low if less than 5 milliliter per 100 gram of deposited metal, low between 5 and 10, medium between 10 and 15. The measured values help by providing an entry point into the methods used for guidance on the welding conditions to be respected for avoiding hydrogen cracking. For a more complete review of this problem see our page on Hydrogen Embrittlement. What's the ideal laser process for a particular application? Flame Propagation Rate is the speed at which a flame runs across a mixture of gases. Iron Soldering uses a heated tool to bring heat to the joints to be soldered. Moving Shoe or Dam is a backing device for containing the molten weld metal. During welding, this type of shoe can slide along the joint. Paste Brazing Filler Metal is a fine mixture of ingredients, metal powder and flux or carrier, to be deposited near a joint for brazing. 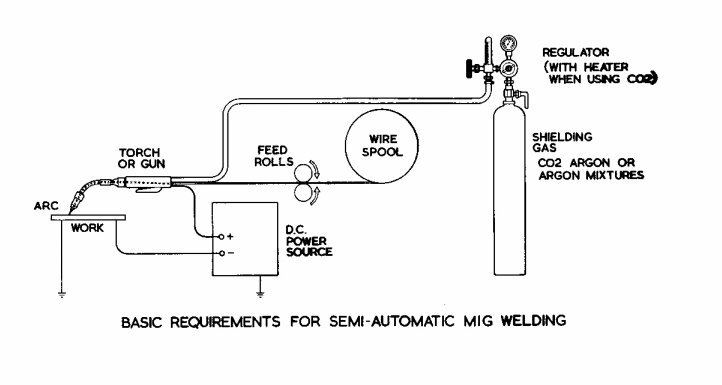 Postflow Time is the duration of a continuing flow of shielding gas after the welding arc is extinguished. Single Square Groove weld is done by welding a square groove joint from one side only. Temporary Weld is used to attach an element to a weldment as an aid for assembling, handling, moving, shipping or working. A recent article, published in the January 2010 issue of the Welding Journal at page 40, briefly describes a few success stories relative to the application of this quite recent computational simulation technique, to predict the outcome of different joint designs and alternative welding processes on specific weld joint configurations. Reduction of Welding-Induced Distortion in an Electron Beam Welded Gear Wheel. Among the results sought by the parallel simulations are the state of distortion, the development of definite microstructures, the map of residual stresses, hardness distribution in weld metal and heat affected zones. The larger diffusion of this computational tool is still awaiting the development of more complete software programs capable of investigating additional configurations and materials. It appears that the knowledge and practice of the technology is already available at research centers and institutes who would presumably be ready to work on contracts funded by interested organizations for virtual solving of their specific practical problems. The American Welding Society (AWS) Committee A9, promoted an initial survey which resulted in the decision to focus on developing a recommended practice for Computational Weld Mechanics of fusion welding of metallic materials to predict residual stress and distortion. The article authors declare that "at this time CWM is rapidly rising from an emerging technology to one approaching maturity". Interested readers are urged to seek the article mentioned above. At least two recent books on Computational Welding Mechanics show up in a Google search. The Pages of this Month deal with two unrelated subjects. Managing Welding should be a mature profession studied not only by welding specialists but also by Management experts who generally cater to the needs of all organizations. "Convincing top management to take action necessary to improve their welding operations can often be challenging. This is often surprising given that they have overall responsibility and are held accountable for their company's bottom line profits." Therefore it seems important to expose a few facts intended to improve the situations where all decisions are left to the workers who, however skilled and dedicated, may not be able to provide adequate management, with results reflecting in the bottom line. Click on Managing Welding to see the new page. The other page describes one of the most cost effective welding processes that can be used, if applicable, to join heavy sections. Once certain difficulties on low impact properties were overcome, the process is now approved also for demanding applications. Click on Electroslag Welding to read the new page. Keep informed on new pages either by subscribing to RSS feed (follow instructions under the Navigation column in every page of the www.welding-advisers.com website) or by visiting the regularly updated Site Map. Write us your comments by using the Contact Us form. Don't use Reply to this newsletter, because that sends it back to me, obviously useless. 9.1 - Reliability is a quantitative measure of the ability of a product or service to fulfill its intended function under stated conditions for a specified period of time. 9.2 - Superconductivity is the property of many metals, alloys, compounds, oxides, and organic materials at low temperatures where their electrical resistivity vanishes and they become strongly diamagnetic. 9.3 - Surface Hardening is a generic term describing several processes applicable to a suitable ferrous alloy that produces, by quench hardening, a surface layer that is harder or more wear resistant than the core. Induction hardening and Flame hardening are produced by preferential heating of the external surface followed by sudden quench. Other processes are based on diffusion enrichment of the surface with carbon and/or nitrogen. 9.4 - Wire Drawing consists in pulling wire through a die to reduce its cross section, to impart the required cross section shape and tolerance, and to control mechanical properties. 9.5 - X-Ray is called a penetrating electromagnetic radiation, usually generated by accelerating electrons to high velocity and suddenly stopping them by collision with a solid body. 9.5 - Yield Strength is the stress at which a material exhibits, in a standard tensile test, a specified deviation from proportionality between stress and strain. For many materials, particularly metals, a conventional offset of 0.2% is used for reporting mechanical properties. A: I'm an "accidental" welder. See below. A: I started by trying to sign up for an auto body repair course at a local vocational night school. All classes were full except welding. (Perhaps that was a hint!). A: I did have definite milestones in mind, but no timeframe. As I learned of different opportunities in the welding field I pursued them. A: Welding Engineering and Quality Assurance. A: AAS degree in Welding Technology, Passing the CWI Test in 1979 using ASME IX and VIII as my (untabbed) reference material. I will never forget the looks on the faces of the folks using the API 1104 code book. If you chose the ASME Code for your reference code during the early versions of the CWI test, you were required to bring Section 8 and 9 which consisted of about 1,000 pages of information. The API 1104 Code was about 100 pages. The test was timed. I had 1,000 pages of untabbed reference material I needed to search for answers. The rest of the people in the room had 100 tabbed pages to search. I felt proud that I took the toughest route and passed the first time. A: Working as a Welding Engineer and thinking I knew a lot more than the welders. Big mistake! A: Learning the hard way to be able to work with all types of people in welding. A: Take it seriously and continue your education. Never stop learning. A: Only the young welders can answer that question. I have seen too many over the years that are satisfied with what they learned and making no attempt to upgrade skills and/or knowledge. A: Not on a large scale. How many pounds of stick electrodes were sold in 2009? People like being comfortable. A: I would tell young folks that it is not a static career. You can go as far as you want to if you have the desire and a plan. Thanks to Paul Ipolito for his nice contribution. Best greetings. Many young welders could take example and encouragement to seek challenges and finding how to overcome the difficulties. Readers who offered to write their interview but did not yet send it to us, are reminded to do so now. 13.1 - It is hard to believe. I am still being asked what is "the most successful welding process for stainless steel". This question is at fault at least in two aspects. Second: There is not such a thing as the most successful welding process for any material. Depending on application, joint types, dimensions, design and mechanical properties requirements, processes, equipment, consumables, and workforce available, production environment, time frame and costs affordable, there may be more than one satisfactory procedures from which the least expensive can usually be selected. 13.2 - Another unanswerable question is the following. "We need to check/test the strength of [...] parts and equipment after complete welding. So, we need to buy a machine for testing welding." This question too is at fault. Supposing that the question refers to a universal tensile testing machine, one should know at least for which material and maximum strength the tests are required. If however the requirement is for testing welding for hardness, resistance to bending, to fatigue, to impact, to fracture toughness or to creep and rupture at elevated temperature, then the information is clearly insufficient. 14.2 - GAWDA Spring Management Conf. April 18-20, 2010 - Hyatt Regency, Chicago, Ill.